Photo by the ever lovely Mary Caroline Russell, who took all the pictures for my last album, Hourglass. I'm getting to the point in my life where I can't decide if birthdays are exciting or emotional. But either way, I turned 27 on April 7th. As per our usual tradition, Michael and I decided to throw a big party to celebrate. My birthday serendipitously fell on a Friday this year, so we used it as an excuse to celebrate all weekend (and actually for a few days during the week as well...bc YOLO). As I've mentioned before, brunch is pretty much my favorite thing. In years past I've thrown a brunch for my friends on the Saturday of my birthday week (it's a super fun tradition, you should adopt it as your own). We bake something with cinnamon (we've done everything from cinnamon toast, to cinnamon rolls, to cinnamon donuts, to churros...), have lots of fresh fruit, and of course mimosas. The best thing about Mimosas is that you can't go wrong! Champagne is delicious on its own, but the key to this famously classy brunch drink is to give it just a hint of tropical sweetness. So my perfect mimosa tastes like champagne mostly, with mint, and a little pineapple-orange juice, as notated above. But YOUR mimosa may need to taste a little more like OJ to suit your fancy! So experiment until you find the perfect mixture. What a good excuse to test it out the day before! *I like my mimosas ever so slightly sweet, so my secret ingredient is a little mint simple syrup. (or this year I made rosemary, as you can see in the picture). You can find mint simple syrup at the grocery store pre-made, or you can simply combine 1 cup of sugar with 1 cup of water in a saucepan over medium-high heat. Bring it to a boil while stirring until there are no more grains of sugar. Remove the pan from the heat and let cool for about 5 minutes. Then add 5-10 sprigs of mint, letting the mint sit in the mixture and wilt. Let sit overnight in the refrigerator, or if you're making it the day-of, try cooling it quickly in the freezer before adding it to the mimosas. 1. In an oven safe skillet, heat 1 Tbs olive oil. Roughly chop the spinach and cook it over medium heat. After it's wilted, transfer the spinach to a colander and press all of the liquid out of the spinach. Let it sit for a few minutes. 2. Preheat the oven to 400ºF. In a large bowl, whisk together eggs, half-and-half, 1/4 cup of the parmesan cheese, nutmeg, cayenne, salt and pepper. 3. While the spinach is resting, heat 1 Tbs of olive oil in the skillet. Then add the yellow onion to the skillet, cooking until translucent. Stir in the garlic, spinach, and mushrooms, cook until fragrant. Gently fold in the egg mixture. Cook until partially set, about 3-5 minutes. Sprinkle feta cheese and remaining parmesan cheese over the top. 4. Place skillet in oven and bake until frittata is puffed up and golden, about 15-20 minutes. Let cool slightly, then cut into wedges and serve. Ah, cinnamon toast! 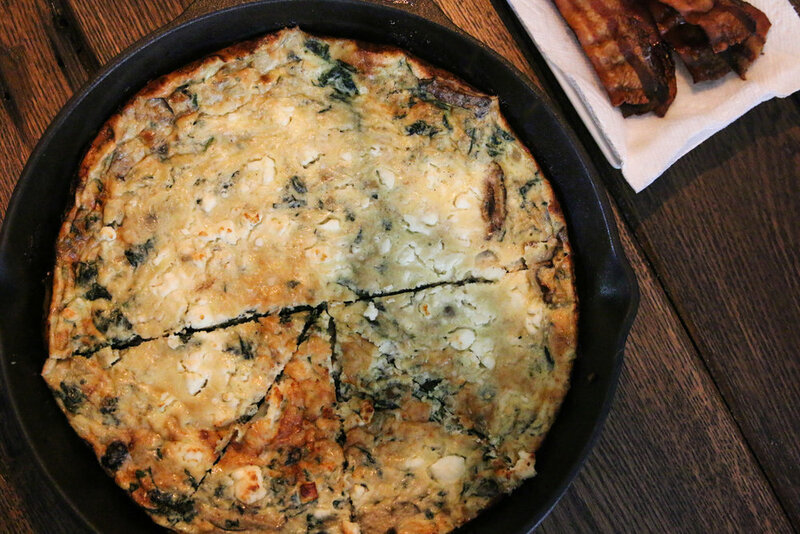 The very first thing that inspired our brunch tradition. It's simple, but intricate. It's comfort food that can be mouth-watering. Follow the steps closely, but as always, you are the chef! Tweak and experiment based on what you like. Soften butter, whip ingredients together in a stand mixer until completely combined. 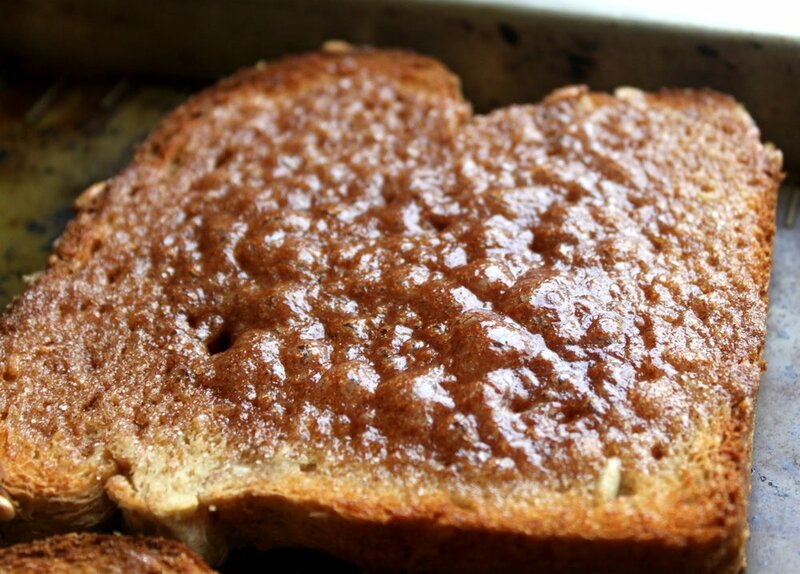 The texture should be crunchy with cinnamon and sugar, but spreadable. 1. Find a fresh, uncut loaf of bread at the grocery store. The Fresh Market makes a really nice white bread that is uncut, if you can't find that you can use a sourdough. 2. Preheat the oven to 350ºF. Cut thick slices of toast, about 1 inch per slice, and lay them out on a large cookie sheet, covered with foil. Butter the top side of the toast & stick it in the oven until the butter is melted. Remove from oven and spread the butter evenly over the surface and return to the oven for about 3 minutes, until golden. 3. Remove toast from the oven and flip. On what used to be the bottom side of the toast, spread a thick layer of the cinnamon spread, all the way out to the crust. Place back in the oven for 7-10 minutes, until the cinnamon is bubbling. 4. Set the oven to broil and leave the toast for a final 1-2 minutes on high heat. Be careful not to burn, and monitor the toast based on your own crunchiness-preference. 5. Remove from the oven and serve with fresh fruit and fresh whipped cream (unsweetened or sweetened, adding vanilla is always nice). If you want to get crazy you can always drizzle some syrup on top. This year we decided to switch things up a little and have the birthday brunch with my family, and then celebrate with friends by hosting an outdoor movie neighborhood party. The weather has been beautifully warm for the last few weeks, so we felt like it was a perfect night to celebrate the first of Spring. Michael and I have talked for years about throwing something like this together, but we hadn't found the perfect excuse to do all this for just the two of us until now. This is the kind of weekend activity that can be an adult birthday party (throw in some mojitos & a popcorn bar), a kid birthday party (think candy and Finding Nemo), or just a fun neighborhood gathering to welcome Spring. We used the speakers from our studio, Michael's laptop and an Epson projector from Best Buy. The higher the quality the better (we splurged for 1080p). Michael set it all up on a coffee table and it worked like a charm. We found some cheap fabric by-the-yard at Hobby Lobby that worked perfect for this. There is a little wooden shed in our backyard, so luckily for us it was as easy as measuring the size of the shed and buying fabric to cover it. We nailed the black fabric behind and the white fabric in front, doubled. Easy set up, easy tear down, plus a cute little roof on top of the movie screen. Because our party was a couples party, we set up little sections of two chairs with some sort of table in between. We knew people would have drinks, candy and popcorn, so its a good idea to give them something to put that on. Michael brought down his old futon from upstairs which was PERFECT. We had lots of cushions, and a fire pit going behind the movie area in case people got cold. Don't forget to tell everyone to bring blankets galore unless you're having your movie night in the middle of summer. Kroger was having a beautiful candy sale--$10 for 10 boxes of candy. So my sister and I went through and grabbed every type of candy we've ever wanted to try, 4 different flavors of popcorn salt, regular popcorn and kettle corn. We planned for 1 bag per person and it seemed to work out about right. It's never bad to have a few bags of popcorn left for your movie nights at home later. There has never been, and never will be a better cake than this. Michael and I actually ordered this Caramel Brown Sugar cake from The Grit here in Athens for our wedding cake. We love it so much. I haven't had it since our wedding almost 5 years ago, so we decided this would be a fun occasion to have it again. (Also, I grabbed this cute cake topper from Target). What's better than having a reason to celebrate? 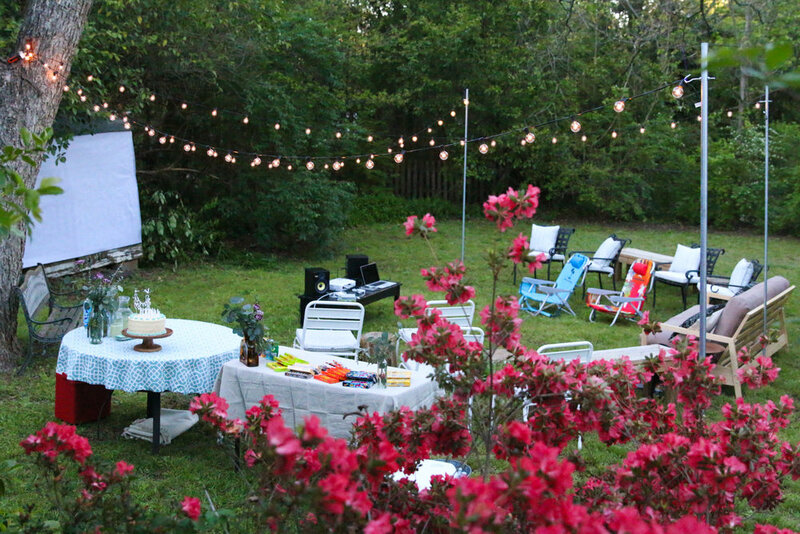 Get festive this weekend and have brunch with your friends, or maybe even host an outdoor movie. Here's a list of my (current) top 10 movies in case you need suggestions. This list is heavy on the RomComs because what's better than a little laughing, crying, and falling in love on the lawn under twinkle lights? Speaking of cinnamon, If you want the recipe for these homemade brown butter cinnamon rolls, click HERE . You can click through the pictures below to get a glimpse at the decadence you'll be making.